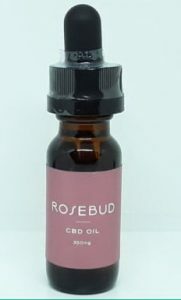 Rosebud CBD is a recently arrived product in the market, based in New Jersey with hemp grown in Oregon. The Rosebud CBD product line includes several different potency options, ranging from 350 mg to 1000 mg, and also a topical salve. Lab testing of the Rosebud 350 bottles detected the presence of some broad-spectrum cannabinoids other than CBD, including CBG and CBC, indicating it does use full-spectrum oil. Potency analysis indicates the tested sample had slightly below the claimed 350 Mg, (only 318 milligrams of CBD detected) but within 10% specifications, resulting in a narrow Pass rating. Rosebud CBD is marketed by Alexis Rosenbaum, with offices in New York.